The trailer for Ponyo has been released! I can't wait to see this movie! 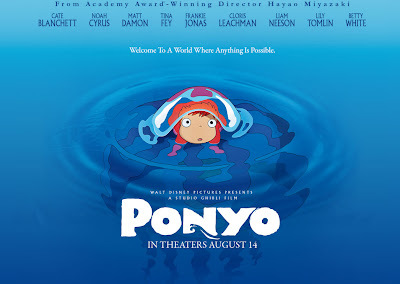 Coming out in August, Ponyo is the next full length feature done by the legendary Japanese animatot, Hayao Miyazaki. You may be familiar with some of his work such as Spirited Away or Princess of Mononoke. I've got almost all his full length movies on DVD, I just love his work. There's a certain magic and innocence to his movies that American animated movies can't seem to capture (although Wall-E was a step in the right direction). His movies are rarely about good guys and bad guys; they are more about innocent characters falling into strange situations. The plot on IMDB reads: "An animated adventure centered on a 5-year-old boy and his relationship with a goldfish princess who longs to become human." It's got quite the star studded cast too, with the likes of Cate Blanchett, Matt Damon, Tina Fey, Liam Neeson and even Betty White! Check out the trailer here (Quicktime / Youtube). Ooooh! This looks like a Beka movie! I'll watch this. Yay, I love Studio Ghibli films, I had no idea that this was on the horizon, thank you! No problemo! Thanks for reading!